Know your cat's tail, know your cat. Although our fluffy feline friends don't necessarily communicate to us using words, they do regularly send us messages. Just a quick glance at your cat's tail -- whether it's quivering, vibrating or aggressively thrashing -- can tell you a lot about her emotions. 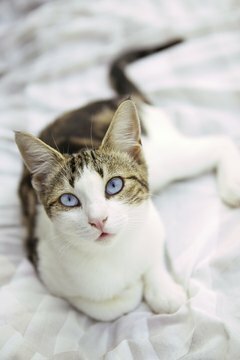 If your cat's tail is quivering so rapidly that it appears to be vibrating, that often means annoyance, especially if you notice her doing this quickly and out of the blue. This quick shaking can also mean that your cat is feeling especially on edge and nervous about something. When a cat's tail seems to be whipping and shaking in a more aggressive and exaggerated manner, that can be a sign that she's angry about something. A really rapidly moving tail usually signifies an especially upset feline. The movement could also mean that she's feeling unsettled and confused -- and she really isn't happy about it. Exercise caution and your wisest judgment around your cat when she's feeling this way. She might be feeling defensive against perceived -- or even real -- predators. If you shock her or go near her quickly, you could risk coming into close contact with her claws or even her mouth -- Yikes. Leave your angry cat alone and allow her some time and space to cool off. Although a tail in motion isn't usually a positive sign, exceptions do exist. For instance, if your fluffball's tail is shooting straight up into the air while it's vibrating and shaking, she is probably feeling giddy about something. If your cat reacts this way upon seeing you, take it as a huge compliment. After all, cats never lie about their emotions -- one of the greatest things about them. If you observe just the upper portion of your pet's tail shaking, that could mean she's frustrated, restless or impatient about something. Maybe she's stressed out that you closed the blinds and she can't watch the chirping birds outside all day, for example. Perhaps she's waiting for you to play "catch the catnip-stuffed ball" with her and you're taking longer than usual to get ready. Why Does a Cat Wiggle Its Tail? "A Cat's Tail Is Puffy, Straight and Shivers"